A great foraging weekend. It's been wet, it's been cool, and the autumn mushrooms have been making an appearance. Friend called yesterday, about a goodly flush of chicken of the woods. Nearby where both of us live too. They took some, left more for me. Off I promptly went, a box and a knife at the ready. (they are?) in prime condition. Laetiporus sulphureus. Beautiful! I carefully cut some off the log, but did not take all of it. Slithered carefully down the bank, and came home. Then, this morning I went off to some woods in a different nearby place where in previous years I have found hen of the woods. I did find a small one. Big enough to share some with my friend. 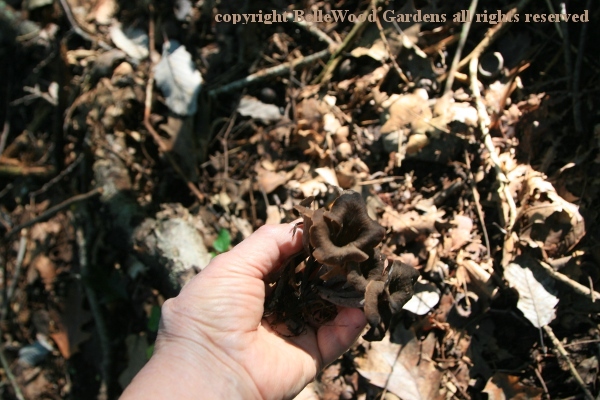 Also, one clump of black chanterelles in prime condition. Not enough to share. irritated, its feathers all fluffed up. 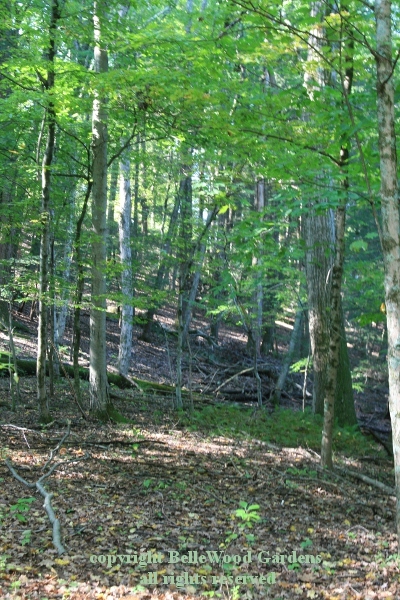 Hens grow at the base of oak trees. 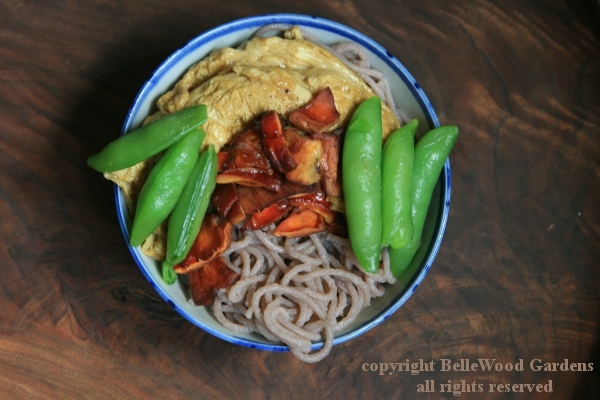 My lunch featured buckwheat flour noodles with sautéed Laetiporus sulphureus, chicken of the woods mushrooms, an omelet made with a little soy sauce beaten into the egg, and some sugar snap peas. As delicious as it is beautiful. Sunday night's dinner. 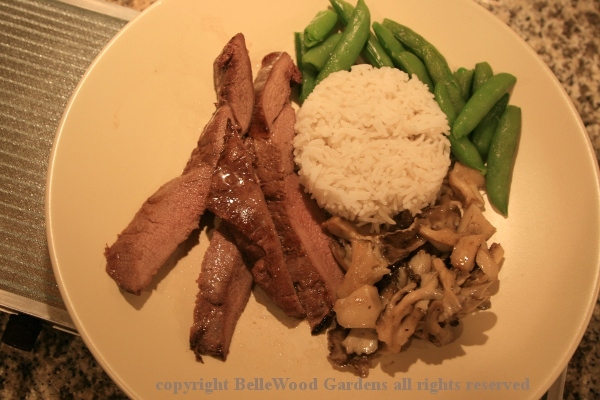 Broiled venison flank steak. Basmati rice. Sugar snap peas. And mushrooms. 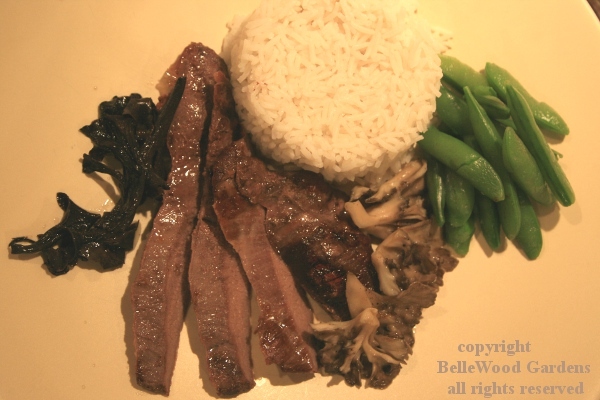 Since black chanterelles really reduce when cooked there was only enough for one rather skimpy serving. 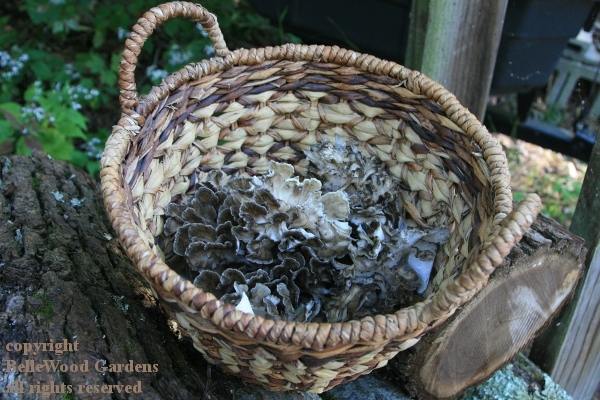 I gave them to Paul, along with some Grifola frondosa, hen of the woods. Which meant that I got a more generous serving of the hen of the woods. No complaints from either of us. 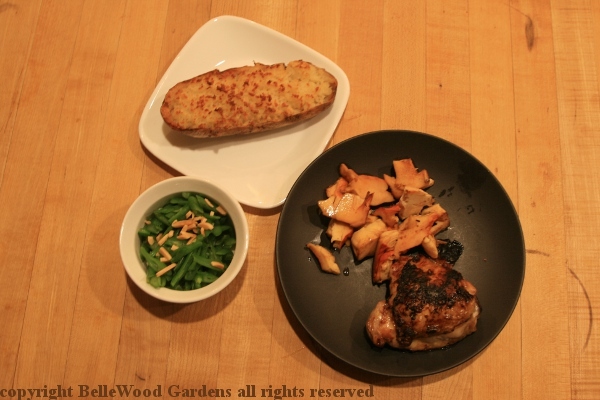 Monday night dinner featured chicken with chicken, of the woods that is. Broiled chicken thighs that had been brushed with a glaze of coarse mustard, brown sugar, soy sauce, and sherry. Twice baked potato: a baked potato was put through a food mill, spooned back into the skin, topped with butter and baked in a toaster oven. Sliced green beans with slivered almonds. And the chicken of the woods mushrooms were cut, sautéed with butter. I then added a splash of white wine, quickly covered the pan and lowered the heat. A few minutes later I set the lid askew so liquids would cook off. Another delicious seasonal meal. Next up, prepare the excess for the freezer. UPDATE: Which I did, preparing a mushroom medley for the freezer. 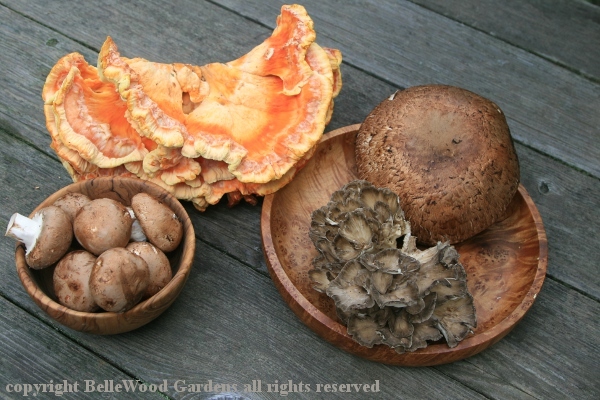 I had the chicken of the woods and hen of the woods I had foraged. Included commercially grown baby bella and one large portobella. 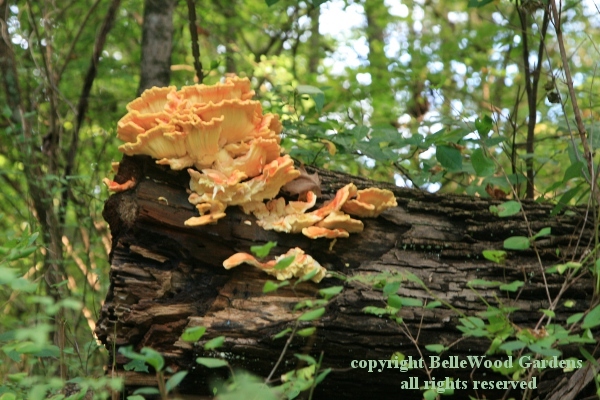 Quantities were as follows: Chicken of the woods, Laetiporus sulphureus,	7.2 ounces = 2 cups diced small. I discarded the hard base. Portabella cap, 8.5 ounces = 4 cups, diced small. Baby bella, 9.5 ounces = 3 cups, diced small. Used both caps and stems. 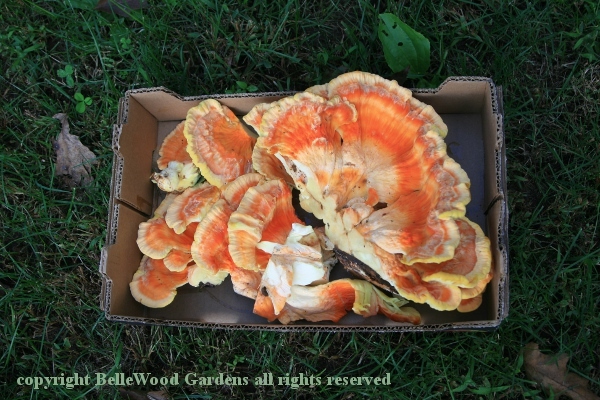 Hen of the woods, Laetiporus frondosa, 5.8 ounces = 2 cups diced small. 2) Dice chicken of the woods, add to onion. Stir well, and continue cooking. 3) Dice portobella cap after removing gills, add to pan along with two additional Tablespoons butter. Stir well and continue cooking. 4) Dice baby bella mushrooms, stems and caps, and add to pan along with 2 Tablespoons olive oil. Stir well and continue cooking. 5) Dice hen of the woods, stems and ruffles. Add to pan. Stir well and continue cooking. 6) Add 1 teaspoon fresh thyme, 1/2 teaspoon fresh ground black pepper, 1 teaspoon salt. Stir well, turn down heat. Cover pan and continue cooking for 20 minutes. 7) Cool, pack in plastic containers, and freeze. I chose to pack in just under one cup portions, pressing plastic wrap over surface befor screwing on caps. Yield: 4 cups. These will be a wonderful addition to sauces, or small batch soup.